"I Want to Die a Peaceful Death"
Jaya’s eyes are strong and clear; her smile, when she flashes it, is bright. She gives the appearance of one with great inner strength, and when you hear her story, you understand how that strength was given ample opportunity to develop. Jaya is in her late 40s. 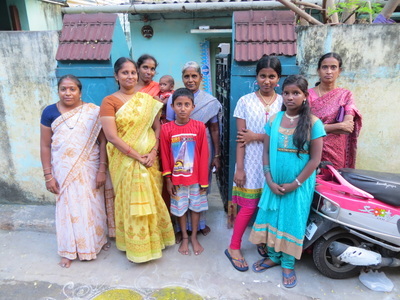 She is in the best work situation of her life; she is a four-kilometer bus ride from an IT Park in Chennai, in Tamil Nadu, India, where she works as a housekeeper, mopping and dusting and cleaning. She regularly alternates from the 6 a.m. to 2 p.m. shift to the noon to 8 p.m. shift. She doesn’t mind alternating back and forth; she is happy for the regular work. That is a question she is tired of asking. She has probably asked herself that question thousands of times, until she tired of asking it, because there were no clear answers. 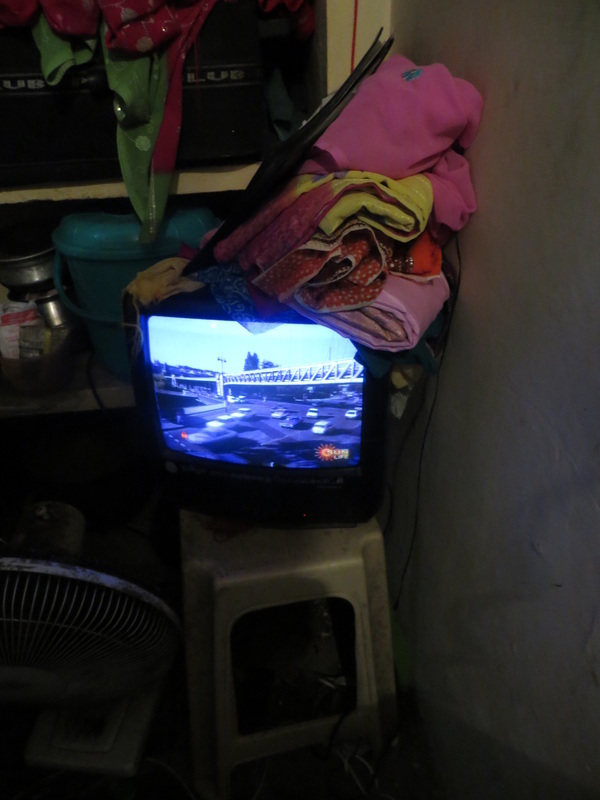 ​Now, her answer is this: she gets up, she goes to work, she comes home, she watches television. She is attracted to the shows that are sad, that show people in desperate situations. That is the kind of life that she relates best to. “I do not want to live a long life,” she says. Jaya outside the entrance to her humble home. Her parents, who were a help to her when they were alive, are gone. A brother is dead. Her husband died. Worst of all, her youngest daughter died as well. All deaths are very hard. But some deaths even more so. Take, for instance, her husband’s death. He did not die of an infection, or a disease, or an accident. His death was brought on by the darkness in his own heart. He did not work. He drank incessantly. He was both physically and verbally abusive to Jaya, who was only 14 when she married him and 15 when she bore her first of three girls. He was a drunkard and a tyrant, and Jaya often took the girls to her parents’ house to live. But her mother kept telling her to return to her husband. It was the right thing to do. So Jaya would reluctantly return. Nothing would change. He would drink. He would terrorize her. He would beat and berate her. He would demand food. What money he could scrape up was spent on alcohol. Fatherhood, for him, ended with the act of conceiving. 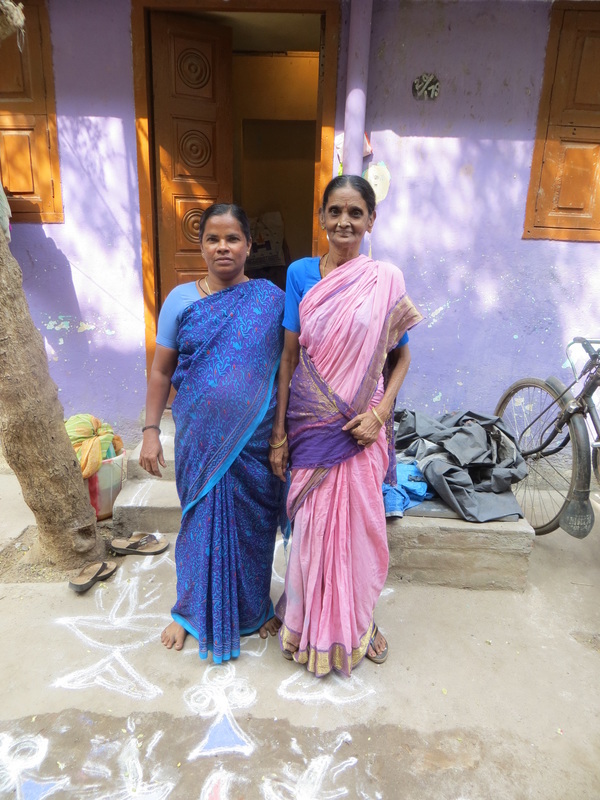 One time Jaya returned home and another woman was living with her husband. “Who is this woman?” she demanded. The woman shrank back from Jaya, retreating to a corner of the room. 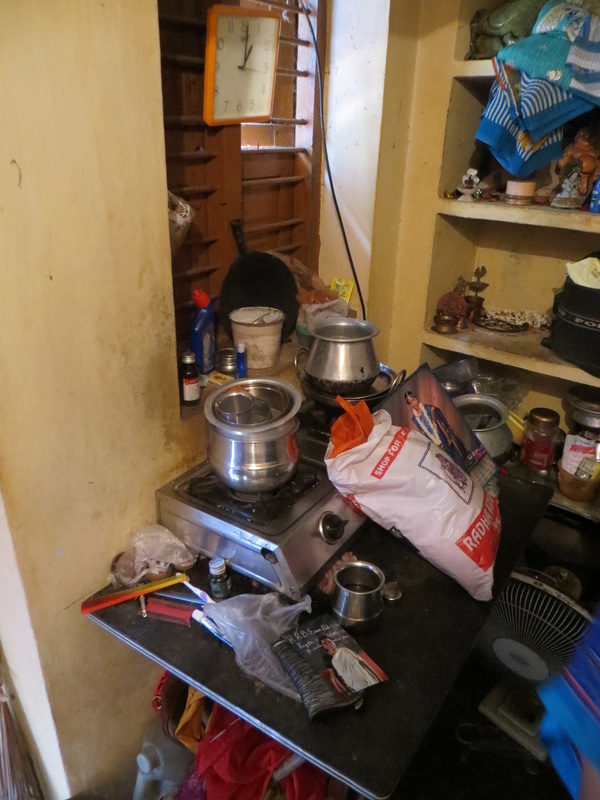 She had been tending a small fire to cook with while he sat in a chair drinking from a bottle of sunda kanji, a sort of “rice beer” made from fermenting rice that is buried in earthen pots and that is popular among the poor in Tamil Nadu. “It is none of your business who it is. You are never here,” he responded. He did not even have the decency to look at Jaya. She saw it in his eyes. He is the king of his house. He can do as he pleases. Anger flared in her own eyes. Enraged, he rose quickly and grabbed her by both her wrists. He then struck her across her face and spat on her and shoved her toward the fire. She put out her hand to break her fall and shrieked as her palm was burned. She cried out in agony and, with him still yelling at her, she stumbled out of the house and made her way, her vision blurred with tears and her hand in extreme pain, to get treatment. Within a few weeks, word drifted back to her. The family of the young woman her husband had taken into their home had come and demanded that he return the woman to them. He refused. Shouting and threats ensued. 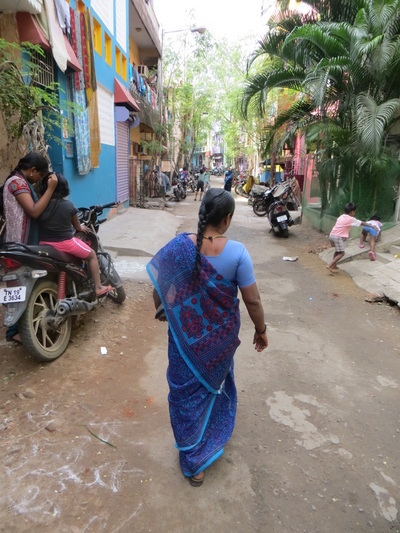 Two of the woman’s brothers scuffled with Jaya’s husband, but nothing more happened. 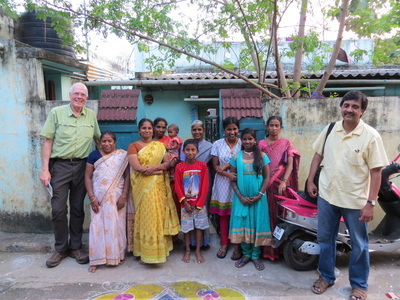 But three days later they returned to Jaya’s home. Again they demanded the return of the woman. Again Jaya’s husband refused. Again threats were issued and ignored. And again a scuffle broke out. But this time the scuffle was more serious. This time the men beat Jaya’s husband. They beat him hard, and he stood no chance against them. Their rage did not abate. As her husband fell to the floor in his home, they continued beating him. One of the brothers kicked him, hard, in the head. They heard him groan. They issued more kicks to the midsection, the back, the head. Jaya’s husband stopped groaning. He lay dead on his own floor, and the two brothers grabbed their sister by the arm and jerked her out of the house. 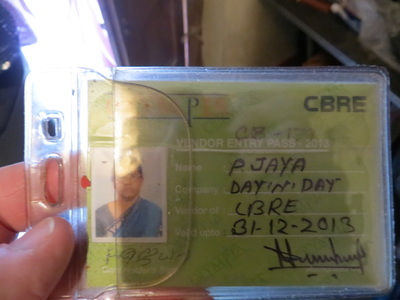 Jaya went to the mortuary where her husband’s body lay. She had to struggle, she says, to retrieve his body and perform the rituals that are commonly performed by Hindus. She bathed his body and put sacred ash on the body as a priest chanted holy mantras. Before the body was cremated, she put rice in the mouth (nourishment for the departed soul), flowers on the body, and a coin in each hand. The body was then taken to the crematorium. And so Jaya entered into an uncertain new phase in her life. She was 23, barely beyond childhood herself, now widowed and responsible for the welfare of her three young daughters. 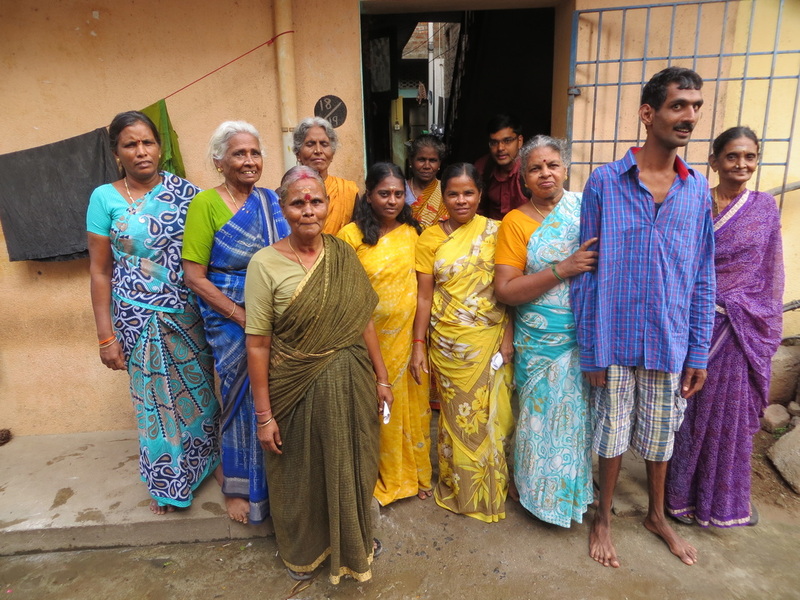 Yes, she was freed from a bad marriage, but she had her girls to provide for, and she had no money in savings and no steady work. She knew one thing: that she was finished with the neighborhood and the house in which so much pain had been inflicted on her. She wanted to, needed to, move beyond that pain. And so she and her girls went to live with her parents. But she was not, as she soon discovered, finished with pain itself. Tragedy seemed to stalk her. Her older brother, after arguing with his wife and perhaps feeling trapped and without hope for either the present or the future, killed himself. Her parents, who were good to her daughters, died one by one. After they died, Jaya and her girls lived for a while with another brother, but her sister-in-law’s harsh words toward her drove her out. 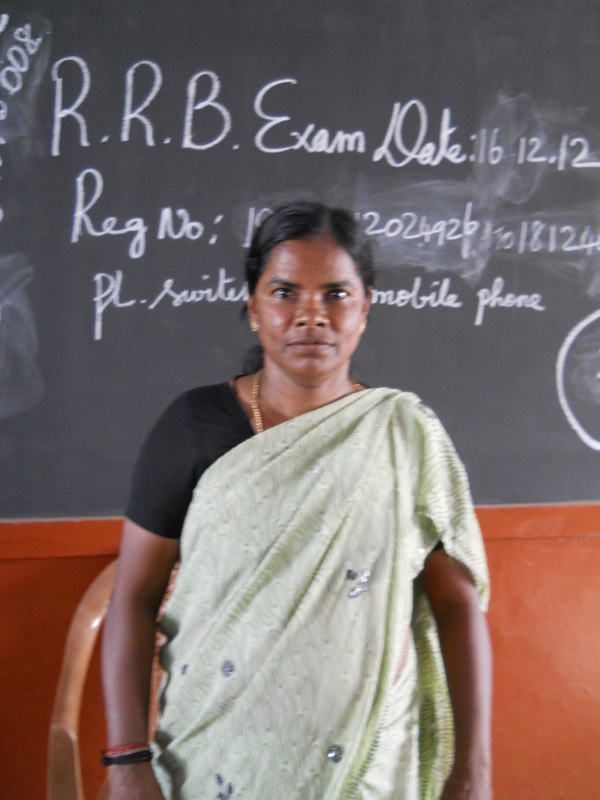 Jaya rented the house next to her parents’ old house, and struggled to make ends meet, earning Rs. 200 ($3.00 USD) doing domestic work in the houses of middle- and upper-middle class families, cooking, cleaning, doing laundry. “I barely had enough money to buy rice,” she says, adding that some of her employers gave her food to take home. “But my daughters did not eat much, so we were okay.” Through her work, she managed to save a bit of money in a chit fund and purchased some simple jewels for her oldest daughter in preparation for her future marriage (bridal jewelry is a revered custom in India, even among the poorest of the poor). Her first two daughters stopped school in 6th and 7th grades, going to work to help keep a roof over their heads and food on their table. They were following in Jaya’s own footsteps; she finished 6th grade before finding work to help her parents. 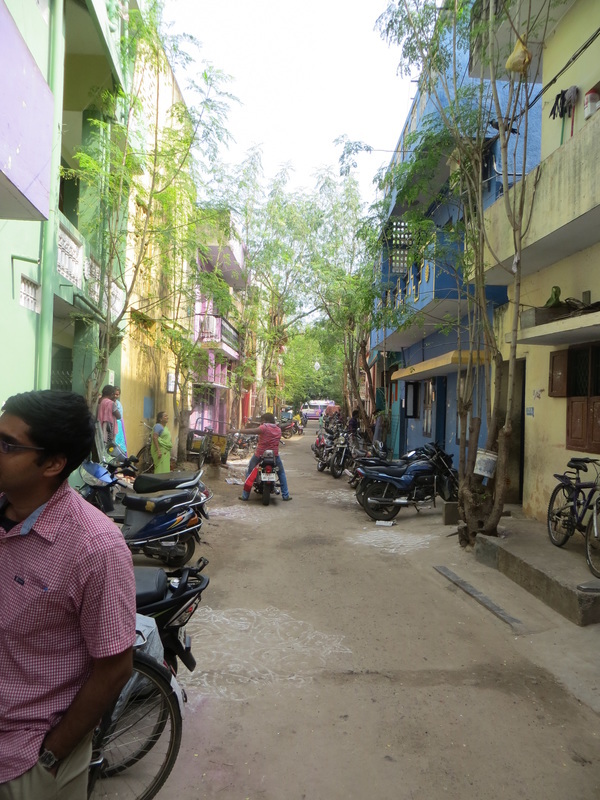 Among the poor in India, this is a common road to take. The youngest daughter stayed in school until 9th grade and then she too went to work, as a tailor in an export company. She worked for two years for the company, but her supervisor was a harsh and unforgiving man. Jaya’s youngest had a sensitive heart. She worked hard. She wanted to keep her job. She knew how important the money was to her family. While her father had never given her encouragement, her mother had, and her teachers had. She was a good student and that was in part why she stayed in school until 9th grade. She would have stayed longer, but her family needed the income. And so she worked, willingly. But she was not used to criticism, especially harsh criticism. She was not used to people yelling at her for being slow in her work or making minor mistakes. She was not used to being constantly watched, constantly upbraided. The eyes of her supervisor bore into her soul and tormented her. He was constantly critical of her. One day he harangued her for wasting a bit of cloth. The cloth cost money. Everything that was wasted meant money out of their own pockets. She was a worthless girl who paid no attention to her work. She must improve her work or she would be fired. No one would want to hire her. He would tell other employees that she was worthless. The words rained down on her like sulfur. Emotionally it burned her deeply and irreparably. She ran home that afternoon and, with no one home, she found a rope and, at the tender age of 17, she hung herself. 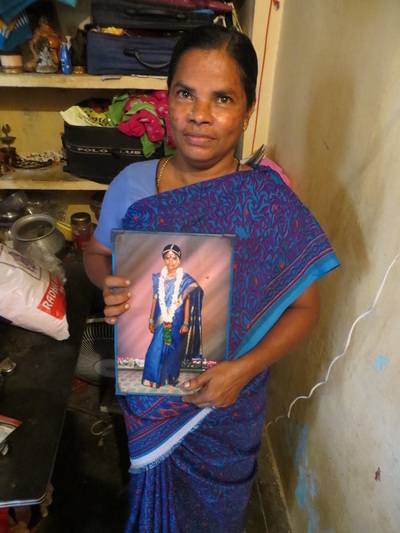 Jaya holding up a picture of her late daughter that hangs in her house. ​Jaya wept and wept over her daughter. This was her precious child, her youngest. Jaya had had such hopes for her, such pride in her. Now she laid her daughter out to prepare her for her final journey, as she had done her husband many years earlier. But the feeling was vastly different. With her husband, the ritual she performed was a duty, an obligation. There was no love lost between them. There was only relief, and sadness—not at losing the man who made her life miserable, but at the missed opportunity of a happy marriage, where each person supported and encouraged and loved the other. Her movements in preparing her husband were mechanical, programmed. But with her youngest daughter, as Jaya tenderly washed the body, still smooth and supple and hardy, she felt such heartache that she wanted to die. Jaya’s own tears mixed with the water that cleansed the body. With trembling hands, she placed the body in a robe, and tied the robe around the waist, and laid flowers on the young chest and stomach, and placed the rice in the mouth and the coins in the hands. The priest chanted his mantras, but Jaya did not hear them. She heard the sound of her now dead daughter’s laughter, the laughter of a toddler, of a young girl. She heard the questions of a young girl asking her mother questions in the marketplace—what vegetables those were, what did they taste like, could they get a piece of candy on their way home. Just one piece. Please? As the body was about to be carried to the crematorium, Jaya fell first to her knees, then to all fours. Sobs racked her body, which shook silently for a while, like a volcano ready to burst, and then the sobs came out in volume. The sounds of grief filled the tiny house and spilled out into the road and were heard by all who passed by. And people who had been in friendly conversation stopped talking, and looked solemnly at each other, and passed Jaya’s house, silently, out of respect. It is no different in India than anywhere else in the world. It is no different for rich people or poor people, for the highly literate or the low-literate. The same holds true across the world. No mother should have to bury her young daughter, and any mother who does so does not fully recover. She goes on, but she does not recover. 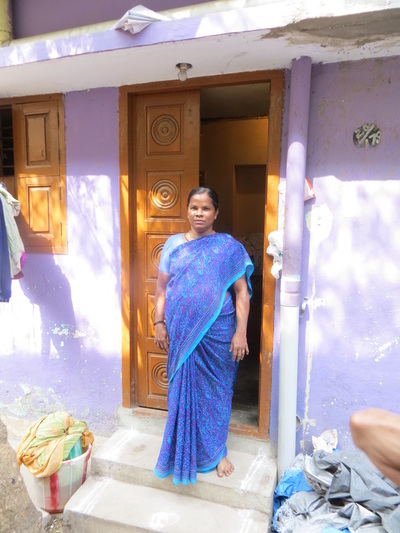 Jaya had not only the loss of her daughter to deal with, but the loss of her daughter’s income as well. The financial shift necessitated a search for a better-paying job; her current income as a domestic would not stretch to cover both rent and food expenses. Her search uncovered the position she has been in for the past 10 years now, working as a housekeeper. The job was gained through a contract agency and includes a provident fund (she contributes 10 percent of her monthly wages and the company matches that contribution in a savings fund) and health insurance. Her contract is for five years and can be extended to remain with the same company, or she might be placed with a new company at the end of the contract. Either way, it is a better situation than her former domestic work. Jaya’s oldest daughter is in a marriage that was arranged by Jaya’s mother. It is not a happy marriage, much like Jaya’s own marriage. The husband is a drunkard and does little work to support his wife and their two children. This daughter is repeating the mistake that Jaya unwittingly made, and it is hard for Jaya to see her daughter in such a marriage. ​Jaya’s second daughter is also married, living in Chennai with her husband and two sons. Her husband works in a shoe leather company and the daughter is a housewife. This daughter is helpful to Jaya, and she has taken her mother on pilgrimage for five days as part of a tour group, for which the daughter paid. Jaya, too, helps support this daughter, giving her money during festivals and in times of stress. Jaya is, above all, a survivor. She has survived a cruel and broken husband; a man who tried to break her, too. She has survived the suicides of her youngest daughter and her older brother. She has survived being a young widow with no money and three children to raise. She has survived the sometime savage twists and turns that each day brings to those who live in subsistence. She has survived the long nights of wondering and praying about the welfare of her children. She has survived the long days of working diligently and hard and being paid very little for it. She has survived the many disappointments that have come her way. Despite the sentiment that Jaya expressed about a peaceful death, she is far from glum. In fact, we have witnessed a fresh hope and energy in her in recent visits (we have interviewed Jaya several times over the years). 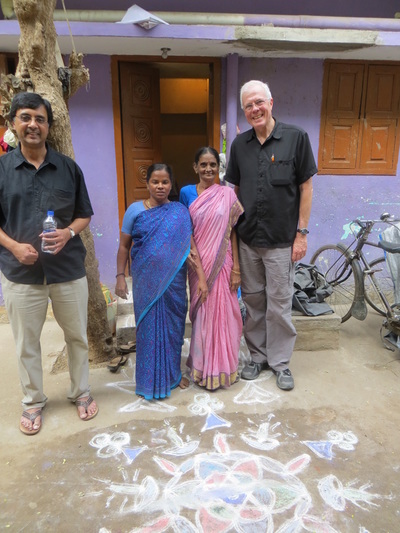 On one recent visit, we learned that many things had changed in her life—some for the better, and some that brought on fresh challenges and concerns. ​On the plus side, she moved from her tiny one-room apartment to a larger one, because her old landlord increased the rent from Rs. 1000 to Rs. 3500. 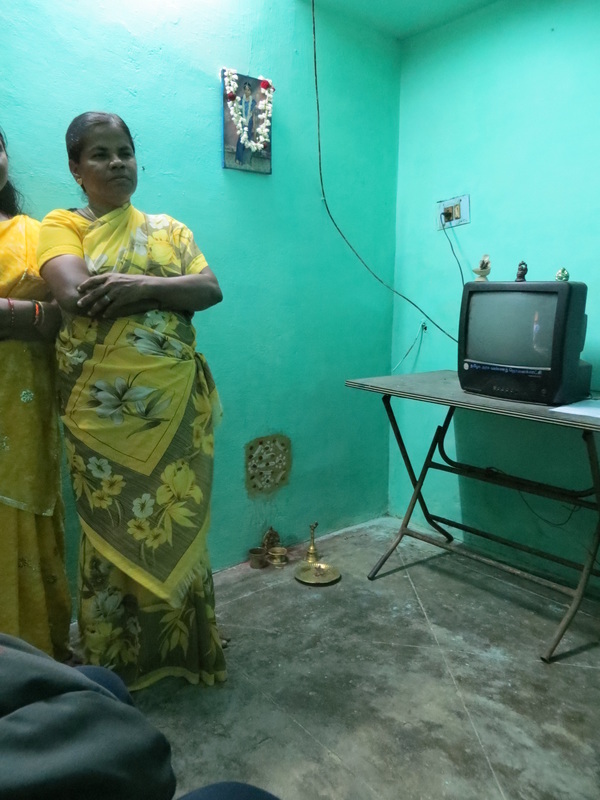 Her new apartment is brighter; her daughter helped her install a fan and lights. She was beaming as we entered her new apartment and she humbly and gratefully received our compliments on her new living arrangements. 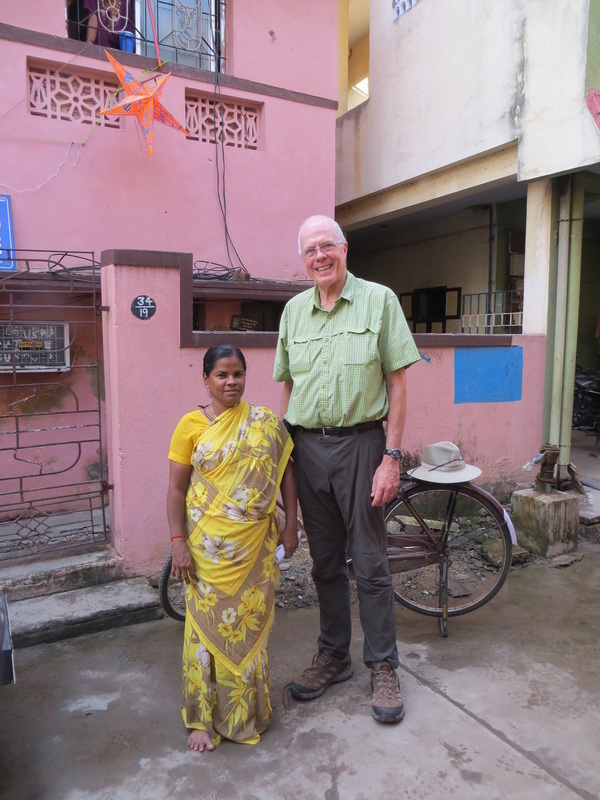 Jaya is a most gracious host with a wonderful gift of hospitality that makes her apartment seem even brighter. 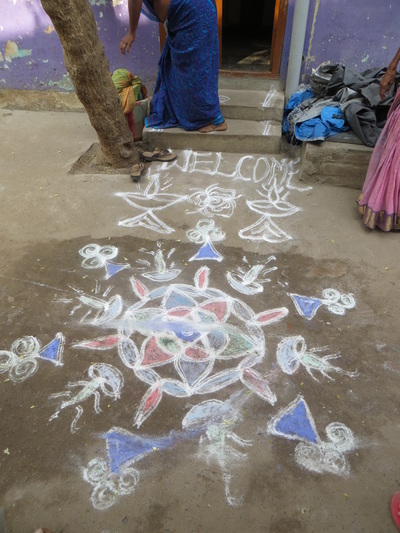 In anticipation of our visit, she had used rice powder to make a welcome sign for us outside of her apartment. She also eagerly showed us off to her neighbors, who insisted on being photographed with us. 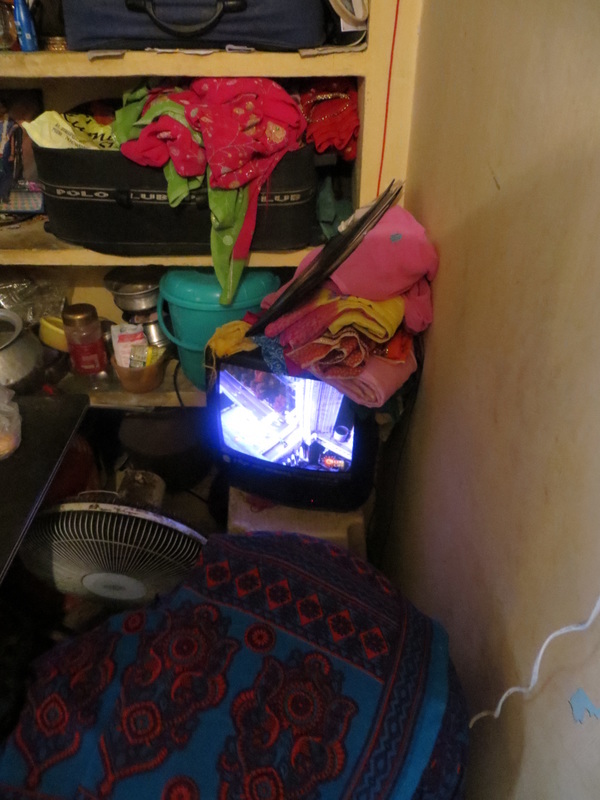 Inside her apartment, the first thing she showed us was a large photo of her daughter who had committed suicide. It is part of Jaya’s shrine in her home. ​The next thing that Jaya showed us was her work ID—you could see how greatly she treasured this card, which identified her as an employee in a respectable information technology park. She is respected in her work, which she approaches with diligence and care. To be respected in her work means the world to her. “Last year I had to miss a month and a half of work due to an injury,” she told us, “but the company still gave me partial pay.” Such treatment was far from her experience when, as a married teenager, she crushed rocks for meager pay. 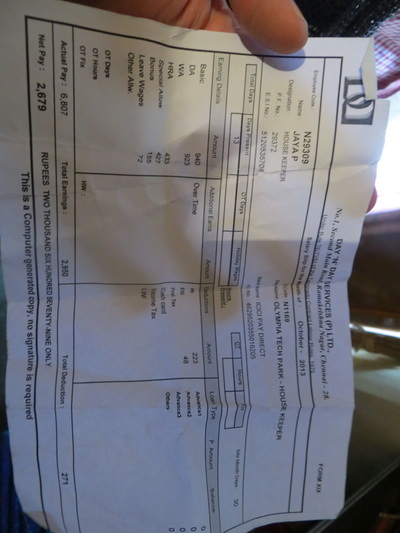 Still beaming, she retrieved a pay stub and showed it to us. To receive an actual pay stub, to be respected and to be paid even when she was off for an injury—such things were beyond her imagination earlier in her life. On the down side, she was ill during the previous year, and her daughter had a kidney tumor. Mentioning this, she said, “My goals are good health and a year in which I do not have to borrow from others.” During her illness, she made three trips to temples; her daughter helped her with the Rs. 2000 that she spent for these visits. In return, Jaya gave her daughter a washing machine, hoping it would lighten her work and improve her daughter’s health. 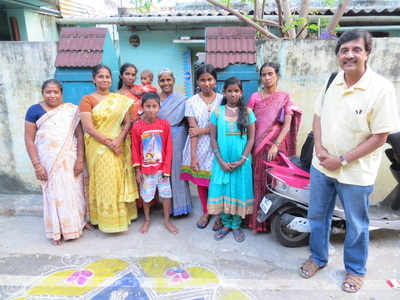 ​Jaya’s life is filled with the ups and downs of those who live in subsistence. She has had much sorrow and hardship in her life. It was good to see her in a nicer apartment, with a job she was respected in and well treated. She takes each day as it comes, facing it with equanimity and a hope that her current state continues until a peaceful death.